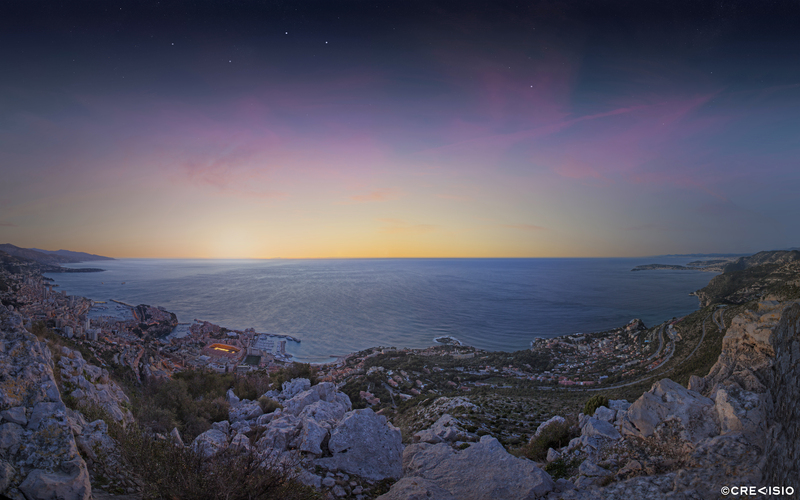 Panorama of the 2018 New Year's sunrise over Monaco. The photograph was taken on the Tête de Chien mountain during the early hours of a windy morning. Thanks to the winds, the air was crisp and clear, free of any humidity, fog or dust, and thus allowed for a beautiful view over parts of the Italian and French Riviera, the Côte d'Azur. This ultra high resolution panorama has a full resolution of 87 megapixel (11,789 × 7,368 pixels at 300 dpi). You may download a free wallpaper version for personal use by clicking on the photo or on the full resolution link provided. For commercial use, please contact Crevisio.